The dedicated Vello LH-40 Lens Hood is specifically designed for use with Olympus's M.ZUIKO Digital 14-42mm f/3.5-5.6 II and M.ZUIKO Digital 14-42mm f/3.5-5.6 II R lenses. It is primarily used to prevent unwanted stray light from entering the lens by extending and shading the end of it. A dedicated hood is crafted to perfectly suit the specific focal length of the lens it is designed for. Additionally, this hood features a non-glare matte finish on the interior surface to further prevent or limit lens flare. Also, since the end of the lens is extended, you get the added benefit of some extra protection from accidental impact. LH-40 Dedicated Lens Hood is rated 4.2 out of 5 by 14. 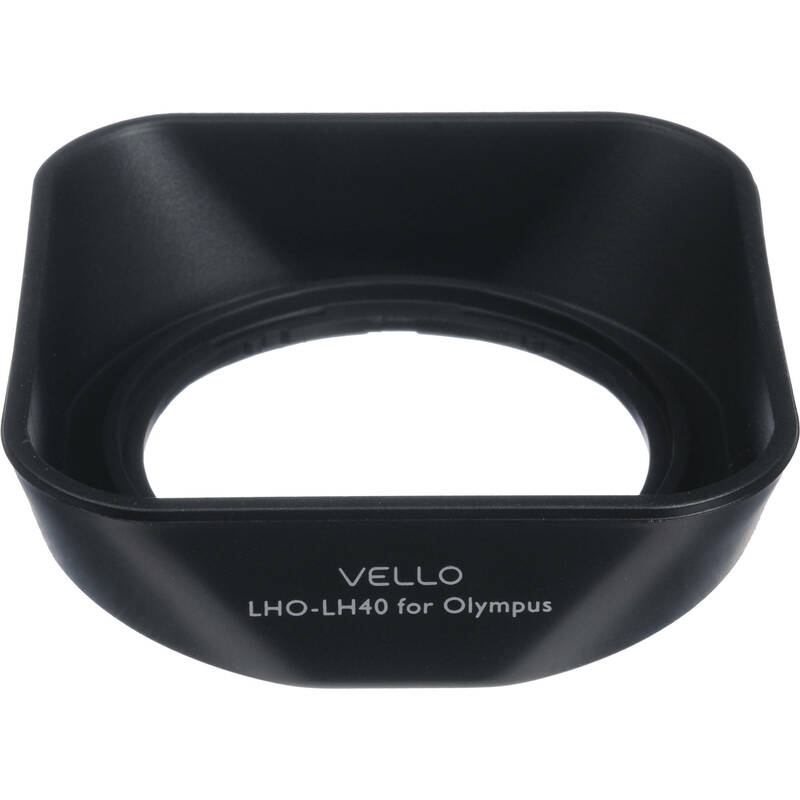 Rated 5 out of 5 by Bud from Vello LH-40 Lens Hood A quality hood for the OLY 14-42 IIR zoom lens. Fits snug and secure, does the job it's designed for, and at a very reasonable price. And, as is always the case with B&H, I blinked once, wiggled my nose and the item was on my doorstep. Thanks guys. Rated 5 out of 5 by John from Fits Well Does what it should... keeps glare of the lens front. Easy to attach, feels sturdy. Less expensive than Olympus brand item. Rated 4 out of 5 by Chris from Olympus 14-42 f/3.5-5.6 Lens Everything seems to be. It fits on snug. The problem I've noticed that it doesn't turn perfectly centered on the Olympus 14-42 f/3.5-5.6 II R lens. Keep in mind that if you also have a filter on the lens that this hood provides even less coverage for sun light hitting the lens and I would recommend a hood that is a bit longer. Rated 5 out of 5 by Greg K. P. from Vello is a Value! It was a bit confusing determining the appropriate lens good for my Olympus Zuiko lens. However, the B&H sales representative knew precisely whT I needed and gave me two choices. I chose the Vello product and it is solid, fits perfectly and does the job! Rated 1 out of 5 by Brian from BEWARE: DOES NOT LINE UP Got 2 of these hood lens. First one didn't lock on straight. Second replacement lens sent also did not lock on straight. Must be a manufacturing defect because it goes on straight but locks on crooked as if they had the threads misaligned. Save your time and money! Other reviewers have stated the same problem! Rated 4 out of 5 by Have camera, will shoot from Works as advertised It's simply a lens hood that gives the lens shading from the sun. It fit my lens perfectly and functioned well. I would have liked it to be a bit deeper to let me shoot in places where the sun was less than about 60 degrees away. Overall it did what I wanted. Rated 5 out of 5 by Elizabeth W. from Less expensive, works well I am using this on my Olympus 14-42 lens for outdoor and bright light situations. I bought my camera to put in an underwater housing and the lens hood did not come with the outfit. This lens hood does the job and was less expensive. Rated 5 out of 5 by Joseph from Nice sized hood Works great. It is small enough to leave on the lens at all times so that I don't have to stop & put it on when I need it.